Basil- extravagant and exciting mint variety combining the aromas of two of the most popular herbs. Unique flavor and scent lead to this being one of our favorites. Chocolate- dark leaved peppermint with a hint of chocolate. A "peppermint patty" for the nose. Julep- named after the famous drink "Mint Julep" but has won many contests as the best mint for Mojitos, because of its particularly smooth flavor. It is one of the sweeter mints. Kentucky Colonel- puckered, light green foliage. Improved variety of spearmint with the same uses. Known in the trade as "The Best". Mojito- this mint is used in Mojitos, a Cuban drink made with rum, powdered sugar, lime juice and club soda. Grow as any mint. Best if kept contained. Orange- hint of citrus is tantalizing in fruit punches and teas. Very special fragrance. Peppermint- old favorite that lends its flavor to many drinks and dishes. Best if grown in contained area. Likes moist areas. Multitude of uses. Keep trimmed for fresh growth and to keep compact. 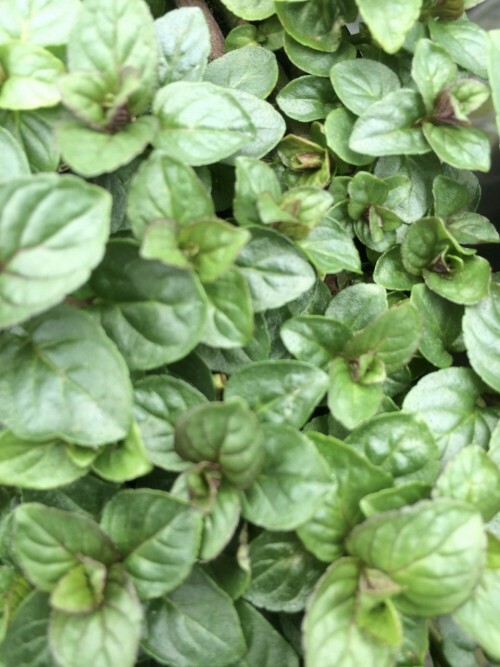 Peppermint Variegated- green leaves with cream splashes. Same smooth flavor as regular peppermint, with a much more showy appearance. Pineapple Variegated- an attractive mint with a pineapple scent. Can be used to flavor recipes and drinks. Keep trimmed for a tidy appearance. Spearmint- popular mint used to flavor cold drinks and make mint sauce. Vegetatively propagated to insure distinct flavor. Savored for its refreshing clear aroma and soothing qualities. Keep trimmed for compact growth.